Wowza, 2 days in a row! Today, Nina adorns my tag with her sweet innocence! This is final challenge for the Anything Goes at Stampotique Designers Challenge SDC176-5. I think Nina stands out in the crowd, just as cute as can be, so my tag is pretty CAS. Oh, you are funny, Gherrie! Love it! She's adorable and so is your tag! Thanks for playing along with us again at Stampotique Designers Challenges! Great tag. Adorable colours & details. Thank you for joining the Stampotique Designers Challenge. Always lovely to see your take. Great fun Gerrie, love Nina! I love seeing your artwork, Gerrie. Most often, I feel I am having a conversation with your right there! Today's piece really made me smile, as I am referred to as "Queen of Camping" in some circles, while others get "Queen in Training" or "Princess of Camping." So, yes seriously, it IS great to be Queen! Agatha's facial expression seem to agree! Great tag, my friend! 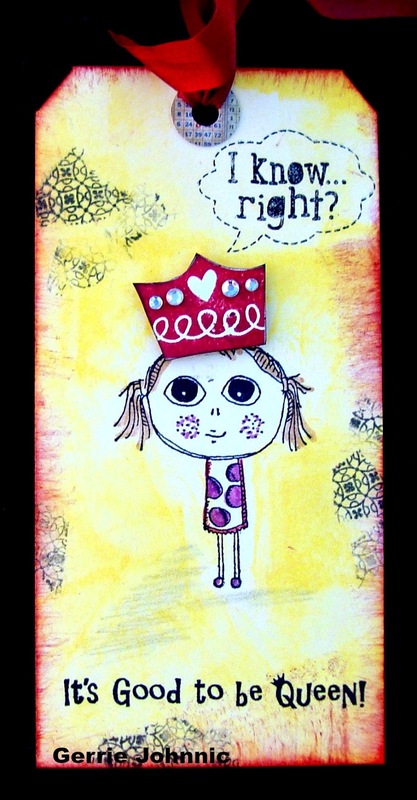 The sentiment and crown are just perfect for Nina!